Save the best for last, they say. This is the part of the house that I am most proud of because I was the one who decorated everything. 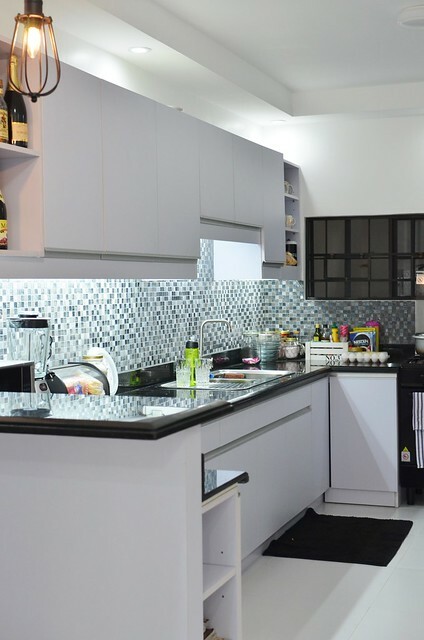 I designed the layout, the kitchen cabinet design, color combination, lahat lahat, ako ang nagdesign. Well, except for the lighting na si Alvin talaga ang bahala for the whole house. I just told him gusto ko maaliwalas yung feel and ayoko ng madilim. Tara, I’ll show you the before and after photos. 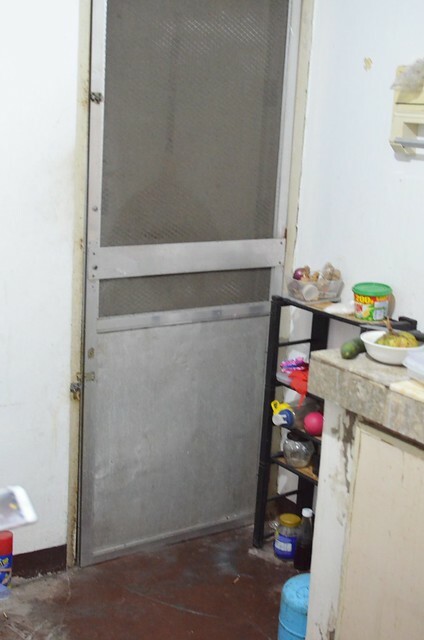 Our kitchen in the old house was really tiny and was in dire need of a renovation. First on my list when we were renovating, I needed to make the space bigger. As in a lot, lot bigger. I asked Alvin to knock down the wall and move it almost 5 meters away. I also asked him to make the lighting brighter. 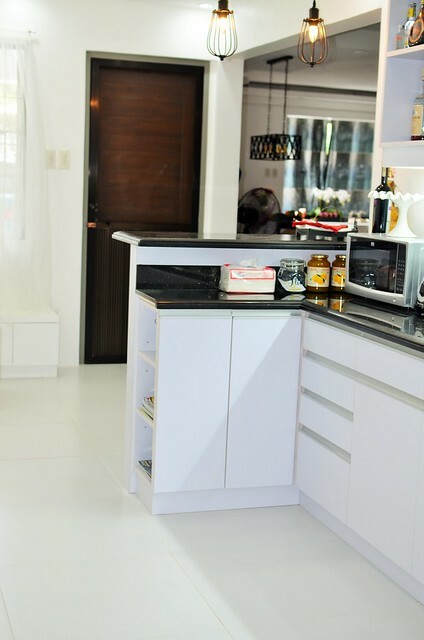 I wanted our kitchen to be black and white lang. 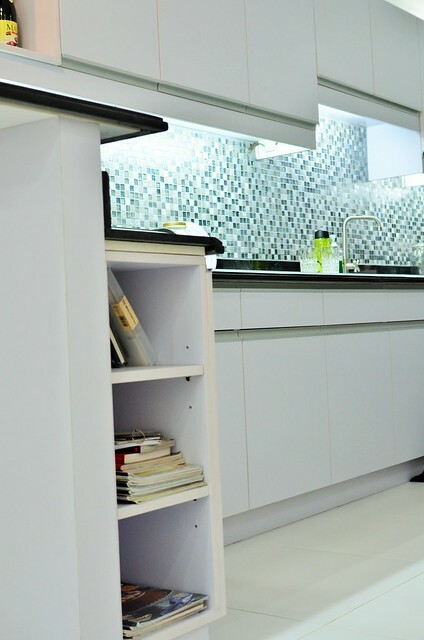 However, when the kitchen cabinets arrived, they were in light blue gray color. I wanted to cry. I’m sure you’ve read here all about my drama and hanash about it. Nevertheless, wala nang magagawa. I wanted to return the kitchen cabinets but we were running out of time na. 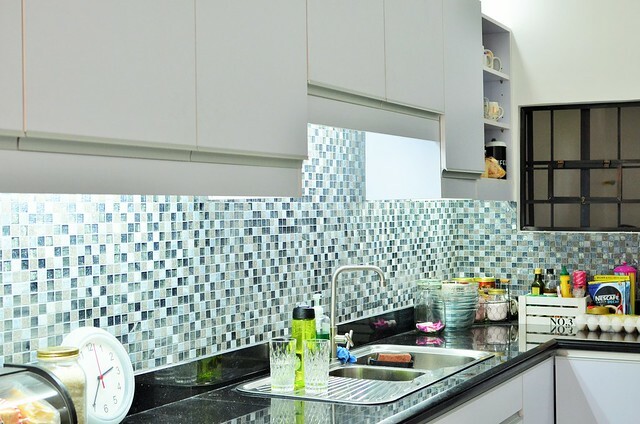 Naghanap na lang ako ng backsplash tiles that will match it. If you will notice, my kitchen cabinets have invisible cabinet handles =) I wanted the kitchen to be modern. At first, Alvin said they looked like office cabinets and I wanted to cry when I heard it. Bwiset. Bakit hindi maappreciate yung clean lines?! Tingnan niyo nga, malinis na malinis tingnan. Walang mga naka-umbok. I realized Alvin and I are very different talaga. He’s more into contemporary and curves. Ako si minimalist, zen and straight lines. Good thing I took dibs na on the kitchen. Sabi ko wag na niya ako pakialaman here. I am happy he let me be. Anyway, dinugo ako sa mahal ng backsplash but it was worth it. I got glass mosaic tiles. Alvin installed lighting under the cabinets and everything looked pretty and shiny, just the way I like it. I can say that this part of the house was the most expensive when it came to renovation costs. Yung overhead and base modular cabinets pa lang were around 70k na. The Granite countertop was around 30k. Halos 5 meters ang haba ng kitchen ko eh. Yung glass mosaic tiles pa.
For the flooring, I chose simple 60×60 cm white tiles. Minimalist and clean ang peg. But you know, it all felt super sulit. I had a lot of storage spaces. 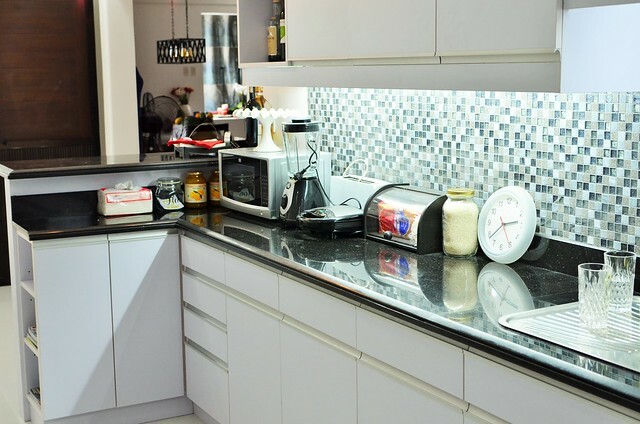 I know my countertop is sturdy and will last for a long, long time. And even though I wasn’t able to get what I originally wanted, I loved how fresh and simple my kitchen look like now. 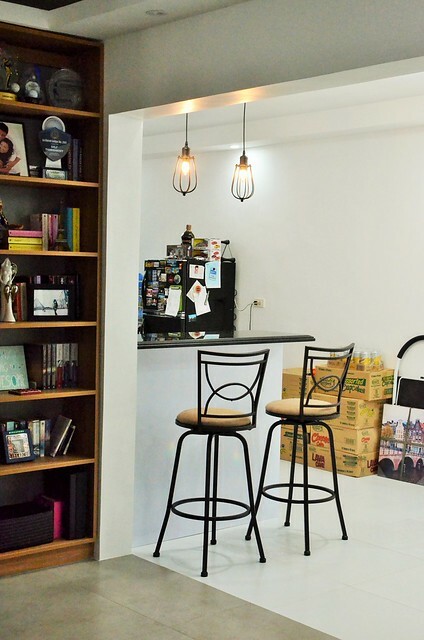 Two more things that I love about this space are the recipe book shelves and the counter top. Cute di ba? I got the idea from Pinterest. 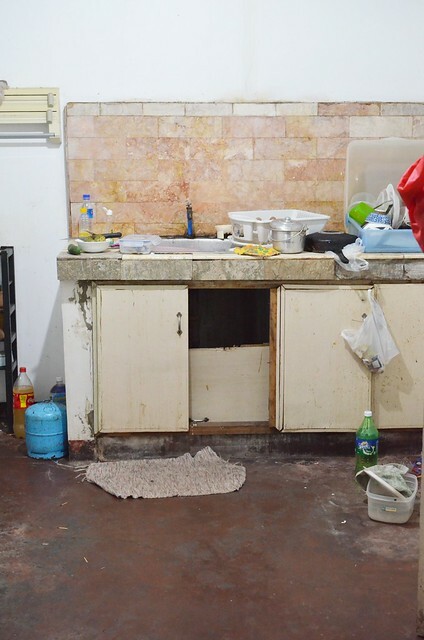 And the counter top, bata pa ako, pangarap ko na magkaron ng countertop so pinush ko talaga ng bongga. Hahaha! Since my kitchen area is very long, I was able to put a breakfast nook. I made sure to make it functional so there are cabinets under the seats. That photo is not update pa pala. 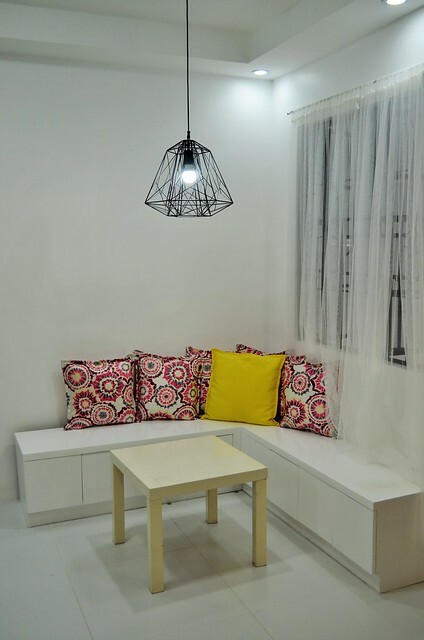 I got this nice table from Upcycle Manila and it really matches the lighting fixtures. I’ll show them to you. Picturan ko lang muna. Salamat muther! Naku nadonate ko na yan! hahaha! Next time! Hi mommy fleur. Nice kitchen. Ganyan din gagawin ko sa kitchen namin. Please share din where you bought the high chairs. Ang cute. Gusto ko din yan.